The April 4 Total Lunar Eclipse is the third of four Blood Moons in 2014 and 2015. 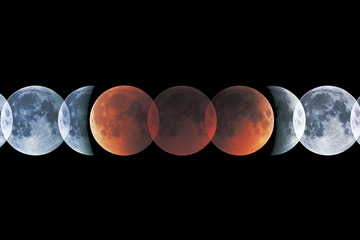 This rare spectacle of four back-to-back Total Lunar eclipses centers over the Americas. This Lunar eclipse belongs to Saros series #132. In its entirety this series produces 71 Solar and 71 Lunar eclipses, spread out over a period of 15+ centuries, from 1208 to 2754. It's noteworthy that the April 4 Total Lunar eclipse is the very first Total Lunar one of this series, thus standing out as cornerstone. Like a roaring dragon this eclipse has the inherent potential to set fundamental changes in motion. Look at the chart: mid eclipse calculated for Greenwich has the Full Moon axis exactly in the plumb line, the midday-midnight power axis. Yet another indication how big the impact of this Total Lunar eclipse will be! Each Saros series has a 'birth chart' displaying its unique character . Saros series #132's date of birth is August 13, 1208. On that day, somewhere close to the South Pole the shadow of a first Partial Solar eclipse touched down on Earth. 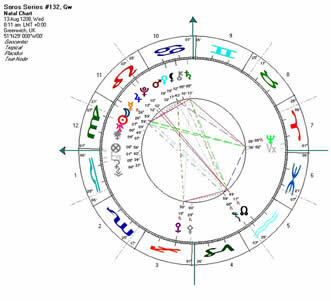 The planetary alignments of that day give a clue of this cycle's key themes. What immediately jumps to eye is the series' bold Leo signature. Sun and Moon are in hexagram #29, indicating danger but also bravery and courage. Pluto and Jupiter at the Lunar South Node indicate too much of something, things are lopsided, out of balance. Something has to be toppled, overcome, and often it's about dictatorship. Another dominant feature of this series is the sign of Cancer, with a nourishing Venus-Mars reunion, the Black Moon and a Saturn-Chiron alignment. All this may indicate a search for new shores, but also emotional turmoil which calls for healing. Planet Uranus in the first degree of Virgo is the locomotive in this chart, inviting us to come along and join the adventure, regardless to where it goes. For the first three centuries, sixteen Partial Solar eclipses were forming, in an 18-year rhythm, while the eclipse' path gradually edged closer towards Earth's equator. Then, on May 12, 1492, this series' very first Lunar eclipse occurs, in that memorable and history-changing year when Christopher Columbus was about to discover the Americas. Saros series #132 seems to have a definite affinity with the New World. It's also very interesting that the Annular Solar eclipse of Oct 22 1911, preceded the sinking of the Titanic (April 1912),an event which made it painfully clear that arrogance and contemptuousness lead to disaster and humiliation. And then, 18 years later, on November 1, 1929, manifested the next Solar eclipse. This time the world was most obviously on the verge of a deep abyss. In its wake, the winter months of 1929/30 following this eclipse gave stage to the infamous stock market crash which would lead into the Great Depression. There seems to be a pattern; eclipses of this series may resonate with rather difficult episodes, often being very painful at first. The silver lining is that testing the limits sets free inner potentials which otherwise never would have actualized. It's the realization of our limitations which spurs us to open up, allowing for new and outlandish visions. Those who listen to economical news might be aware of many extreme dangers lurking in the world's financial markets. In the wake of the 2008 crash the economy was flooded with cheap money, the US Federal Reserve for example expanded its balance sheet five-fold! It would have been fine if all this extra cash would have been distributed, so everyone would have had the chance to prosper. The banks however decided to keep the lion's share for themselves. They kept it as their cheap gambling money, not following through, lending funds out at lowest rates. Today, for every dollar the average American bank owns it has twenty-seven additional dollars of open bets in highly volatile derivatives. A simple 3.3% move against the expected trend will wipe out their entire capital! Chances are, the end of our world's monetary system is closer than we ever would imagine. 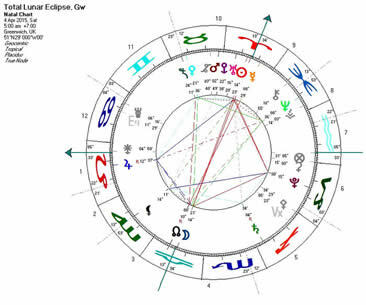 At maximum eclipse the Moon is at 14° 21' Libra, while the Sun is at 14° 23' Aries. That the eclipse is cresting a few minutes prior to the exact Full Moon indicates that pressure is still building up, the Moon is still 2 minutes shy of perfect fullness. Russell Brandt is very much at the nerve of present times. He's a key figure of our times, a true rebel, a revolutionary! On April 24, his new movie will be released, "The Emperor's New Clothes". It looks as if we're at the beginning of a big revolution which is going to churn everything. Profound societal changes are on their way. People are waking up to why there's so much misery everywhere we look, and realizing how we give our power away. Following the road of least resistance we've been giving in to our conditioning. However, as of late challenges have been notching up in intensity. We're dealing with a frequency shift, challenging us to function in a new environment. The really good news are that we're cornered! There's nowhere to go than straight through the center. Chances are when everything is at stake we will be able to mobilize hidden resources we never would have dreamed existed!